Chrysler has agreed to recall 2.7 million Jeeps that could be at risk of fuel tank fires, after initially refusing a government request to do so. The US company said it had resolved its differences with the National Highway Traffic Safety Administration (NHTSA). The recall affects Jeep Grand Cherokees from 1993-2004 and Jeep Libertys from 2002-07. 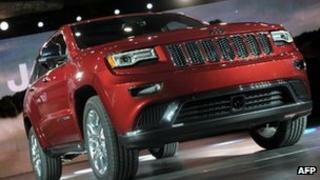 Chrysler maintains that the vehicles are not defective, but said it regards safety as a "paramount concern". It said dealers would inspect the vehicles and, if necessary, provide an upgrade to the rear structure to better manage low-speed crashes. Earlier this month, the NHTSA asked Chrysler to voluntarily recall the Grand Cherokees and Libertys, saying that if hit from the rear, the fuel tanks could leak fuel and cause fires. It said the location of the tanks behind the axle and their height above the road was a design defect. The agency said it had evidence of at least 37 rear-impact crashes and fires, causing 51 deaths. At the time, Chrysler said it did not intend to recall the vehicles. But in a statement on Tuesday, the company said: "Chrysler Group's analysis of the data confirms that these vehicles are not defective and are among the safest in the peer group. "Nonetheless, Chrysler Group recognises that this matter has raised concerns for its customers and wants to take further steps, in co-ordination with NHTSA, to provide additional measures to supplement the safety of its vehicles."